We saw a quick video clip of last week, where Sean Deeley, Aaron Andrews and Sonny Wildside DREW in a Triple Threat Match! Three ultra-talented fan favourites teaming up here, and they all seemed to get on really well in this match. Aaron Andrews spent a long time in the ring, and was controlled by the Ring Generals in particular. Their tag team experience paid dividends throughout, and they looked like they were going to carry their team to victory. However, the inexperienced Ernest Youngman made a crucial error in boasting too much, and Andrews was able to fight his way back into it. A 'hot-tag' to James Hernandez saw the Television Champion come in and change the momentum completely! In the end, Youngman was pinned after Sonny Wildside hit his 'Fear Factor' from the top rope! Alex made the ruling, and now we have a Four Way Match for the Television Championship...!! We saw a wrestler profile next for, 'Mighty' Danny Cavanagh...! At Glory this Saturday, Danny Cavanagh will go 1 on 1 with the undefeated 'Monster' Gargantuan!! It'll be Gargantuan's toughest test to date, but so far he has overcome every obstacle put in front of him... With ease...!! Harrison Hash has been in very good form in 2017, racking up wins, and putting on good matches. This was more of the former than the latter, as he and Lord James King don't really click as opponents. The finish was excellent again from Hash though. He lifted King up for his 'Century Suplex' (delayed vertical), and then as he let King down, he let him land upright on his feet, and he locked him in his 'Montreal Deep Sleeper' finisher! Gargantuan was mentioned earlier in the show, as someone who has the ability to overcome any and all obstacles put in his way. This was not really one of those obstacles. Hugh Ancrie put up a fight, but he was never going to be the man to end Gargantuan's 16 month undefeated streak. In the end, he fell to the 'Ultimate Backbreaker'. As any good broadcaster should, Katie asked Alex the question on everyone's lips: Who is the fourth man in the Main Event of Mid Summer Madness...?! Katie's next question was also a good one, she asked about Dan DaLay's Tweet last week, and what it means to him!! He said, as it regards the Main Event of Mid Summer Madness, that Jack would find out when everyone else does...!! However Orson became the subject of a three-way 'bidding war' between 21CW, NOTBPW, and USPW!! This match was a battle of the veterans in many ways. Owen Love, The Natural, and Duane Stone have been around for a long time, and have all worked in NOTBPW on and off for decades. Debuting at the age of 18, Edd Stone is a 12 year veteran in his own right, and it made for a compelling match. Love and Natural controlled Edd for a little while, much to the joy of the fans. But a tag to the 'Rock Solid' Duane Stone allowed Edd a much-needed breather on the apron. Duane used his size and thick frame to keep Owen Love down, and in the end, he hit Love with his 'From Canada With Love' after Edd got rid of The Natural with a harsh looking drop kick to the knee!! The Stone Brothers celebrated their win by arrogantly standing over Owen Love... The Natural wasn't happy with their actions!! They removed their jackets, and dropped the Belts on the ramp... before sprinting to the ring for the save!! Gold was appreciative of the comments, but both youngsters got a huge shock when Steve DeColt turned up after coming around the corner..
Mark Griffin is NOT a small man. In fact, he's taller and slightly heavier than the Samoan Savage Akima Brave. But that didn't stop Brave from throwing Griffin around the ring. The intensity at which Brave works makes him a force to be reckoned with each and every time he steps into the ring. Tonight, he put Griffin away with a brutal looking headbutt from the top rope called the 'Suicide Diving Headbutt'. Brave laid the microphone down, and stomped to the back... Walking past the hurt Mark Griffin and snarling at him...!! Alex fired him on the spot... and his tag team partner Derek Frost... and his son got fired from developmental too!! As the voice-over explained... 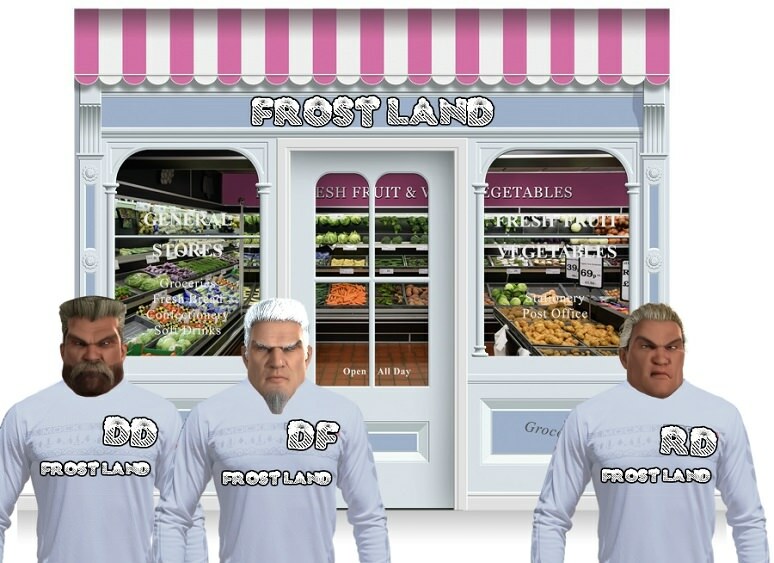 This... was 'Frostland'... A chain of stores owned by none other, than Derek Frost!! Alex has called for the talks, following DaLay's cryptic tweet, where he threatened to reveal a secret that Alex has been keeping... But what will Alex do to silence DaLay...?! This match wasn't quite as good as their encounter from six weeks ago, but both DeColt Brothers will be happy with their work here. Steve DeColt controlled his younger brother Ricky (DeColt) for large portions of the match, using his size and strength advantage to good effect. But Ricky isn't as far behind his brother as he used to be, in terms of size, so he was able to fight back into it well. Nobody could tell who was going to win this one, as both men hit all of their trademark offence. Ricky even hit his 'DeColt .45' super kick on the outside of the ring!! But by the time he'd rolled Steve back into the ring, his brother had recovered enough to kick out at the last second! Ricky was exhausted by the end of the battle, and his fatigue caused him to walk onto a 'DeColt Stampede' that he might otherwise have been able to avoid! Ricky will battle Tim Westybrook this Saturday at Glory, knowing a loss will throw the Main Event of MSM into complete turmoil!! Going to be taking a week or so off, because I'll soon be off on my HONEYMOON!!! That's right b****s... I got MARRIED!!! Someone actually wanted to become Mrs. Lloyd!!! But I'll be back... I have the next THREE episodes of Championship Wrestling FULLY written, plus the Glory pay-per-view also finished... So there's plenty more to come, and I'll continue writing when I'm back from Tenerife.